Timber stair case – Constructed onsite by Streefland Homes carpenters. Window frames built on site to suit client supplied lead light windows. 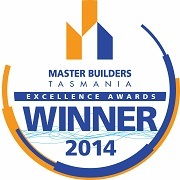 Winner of 2014 Master Builders Association Annual award – Best use of brick.